Any gold prospector who has ever used a metal detector to find gold nuggets understands the challenges and steep learning curve associated with nugget shooting. Searching the goldfields for nuggets is without a doubt the most difficult types of metal detecting that you are likely to encounter. The highly mineralized ground of almost all goldfields can be challenging for even highly experienced detectorists, a much different experience than you will encounter when searching for coins in the city park. In most gold bearing areas, there are two main things that are the most difficult to deal with; hot rocks and trash. 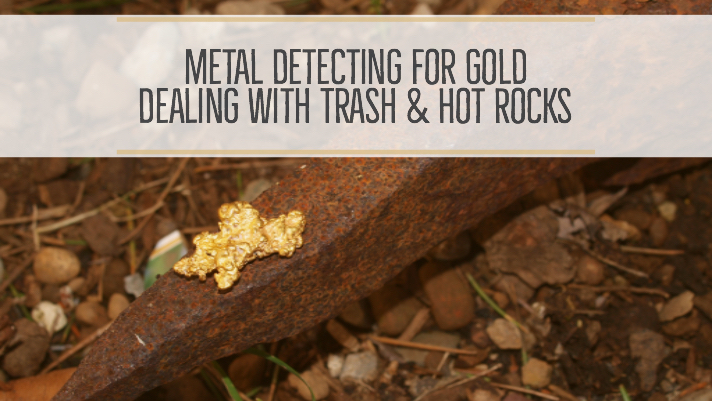 Dealing with trash is without a doubt one of the most frustrating aspects of metal detecting for gold nuggets. Since many of the best gold bearing areas across the west have been previously worked by prospectors, there is a lot of rubbish to deal with. The miners who hunted for gold a century ago weren’t as conscious of leaving garbage behind like we are today. Nearly all of the old placer grounds that you will encounter today will have an abundance of junk, ranging from tiny boot tacks to huge 30-gallon oil drums. While modern metal detectors generally have some form of discrimination on their machines to help differentiate between gold and iron trash, the fact is that there is no perfect discriminating metal detector. It is an unavoidable fact that digging trash is just a part of metal detecting for gold nuggets, and even the most skilled detectorists out there still have to dig a whole lot of it. If you get lazy and find yourself trusting your metal detector to tell you only when to have found gold, I can guarantee you that you are missing a pile of nuggets. Another challenge that detectorists have to deal with in the goldfields is hot rocks. Simply put, hot rocks are common rocks that cause a metal detector to sound off. You will typically encounter two types in the goldfields; negative hot rocks and positive hot rocks. A negative hot rock will generally give off a “boing” sound, and they will seem to respond more as the detector is moving away from the target, rather than hovered directly over it. Negative hot rocks are usually the easiest to identify, as they produce a more “hollow” sound that is not as sharp and distinct when compared to a solid metal target. The other type that you will encounter is called a positive hot rock, and these can be a real challenge to deal with. Essentially they are highly mineralized rocks that will give a sharp sound very similar to a metal target. These can be extremely frustrating in certain areas; in fact many types of metal detectors will be nearly unusable due to the “hot” ground that will cause so much noise from the machines that it is nearly impossible to differentiate between gold and the chatter of hot rocks. Fortunately, metal detector in recent years has improved dramatically, which has made a significant improvement in how we deal with both trash and hot rocks. Certain detectors have discriminations that are becoming quite accurate in identifying certain trash items. Often they can give a fairly reliable identification to common items that are encountered. For example, in a day of metal detecting it is not uncommon to encounter several hundred old square nails at varying soil depths. Due to their relatively large size and uniform shape, these iron objects can often be identified and ignore. Unfortunately, the same cannot always be said for smaller items like little bits of wire, boot tacks, as well all less conductive metals like brass bullet casings and lead bullets. Remember, if there is any doubt at all, it is better to dig it than ignore it. Otherwise you may be walking past a nice gold nugget. Identifying and dealing with hot rocks can be a bit more challenging and frustrating, especially for a beginning prospector, or when using a new machine that you are not yet used to. A metal detector with a good discrimination should be able to “blank out” most hot rocks. If they won’t blank, they will often give a very low or very high reading, and that number will often sporadically change. It is also worth mentioning that the newer Pulse Induction type metal detectors do an excellent job of ignoring hot rocks. Unfortunately these detectors cost several thousands of dollars. The more common VLF metal detectors are more likely to respond to hot rocks, even machines that are specifically designed for the goldfields. Dealing with both iron trash objects and hot rocks is by far the biggest challenge that any gold nugget hunter has to deal with. I wish that there was some huge secret that I could tell you that would help you deal with it, but the simple truth is that there are no real shortcuts. The best advice I can give to anyone is to learn your detector; understand the different tones and responses that it makes when out in the field. When you are digging a target, make a mental note of what it sounded like. After you have dug enough trash and hot rocks to fill your pockets, you will likely notice that there are minor differences in the response that your machine makes compared to gold nuggets. There is no avoiding that hunting for gold with a metal detector is challenging, easily the most difficult prospecting method to master. Even those who are great at it still dig up a lot of trash and have frustrations with highly mineralized ground. 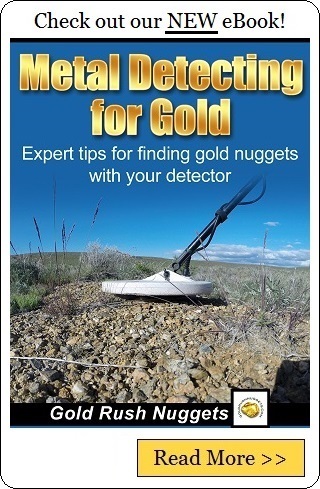 Do your best to learn what your metal detector is telling you and hopefully you will be digging nuggets in no time!